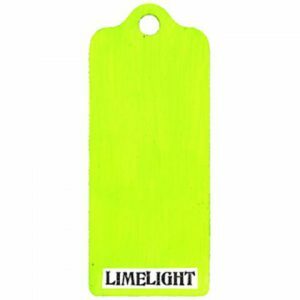 A bright fun tag today. 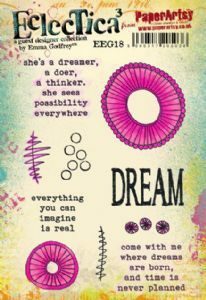 Today I have worked with EEG18 PaperArtsy Emma Godfrey stamp set. 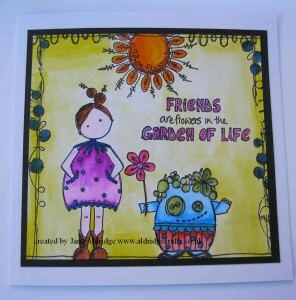 This fabulous bold flower is perfect for this tag. 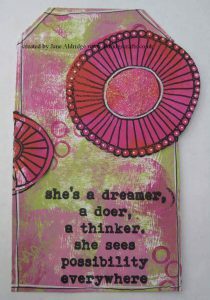 I started by applying PaperArtsy chalk paint in Bouganvillea, Coral and Limelight using a brayer to get that rustic background on the tag. 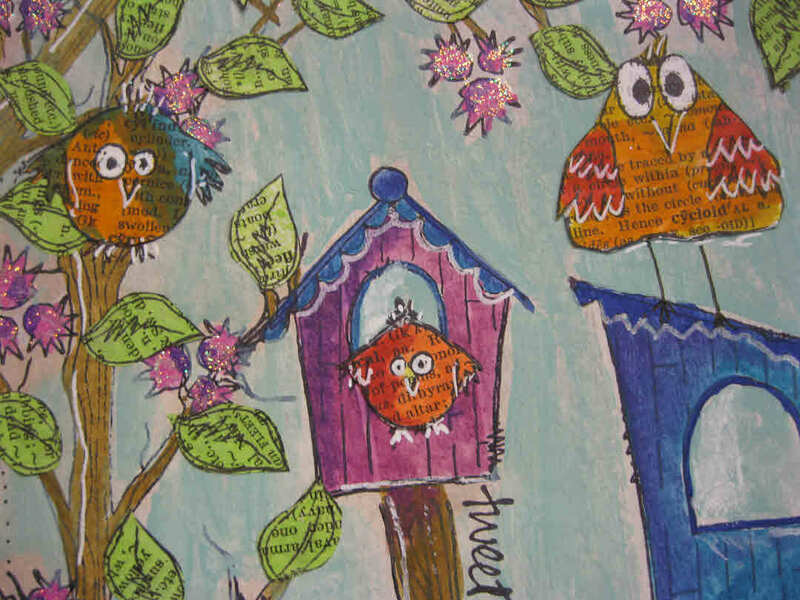 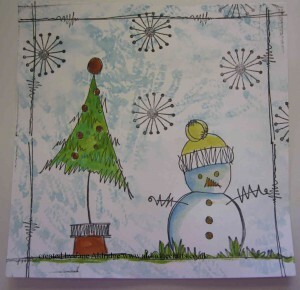 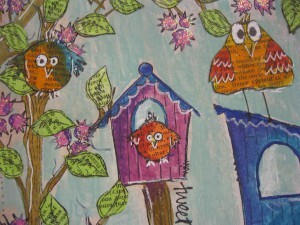 Then stamp in the paint using the circles and the squiggle line stamp to add some extra detail. On separate card, I applied a mix of the coral and bouganvillea paint and then once dry, stamped the big flowers and cut out. 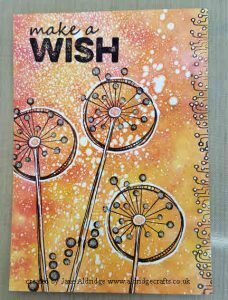 A few white highlights and a hand-drawn border, and then stamping the lovely wording at the bottom was the finishing touch. 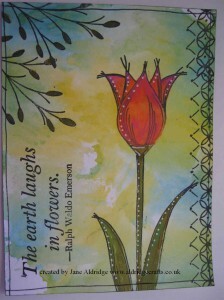 This panel has been created using Alcohol Inks in a mix of rich oranges and reds. 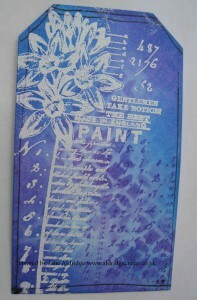 I’ve applied the ink using the applicator to glossy card and then sprayed it with Stazon Spray stamp cleaner. 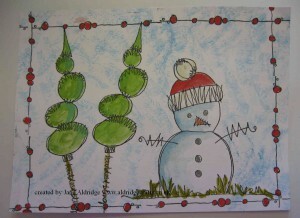 The cleaner is how I achieve all the white speckles (don’t spray Blending solution as it is flammable!). 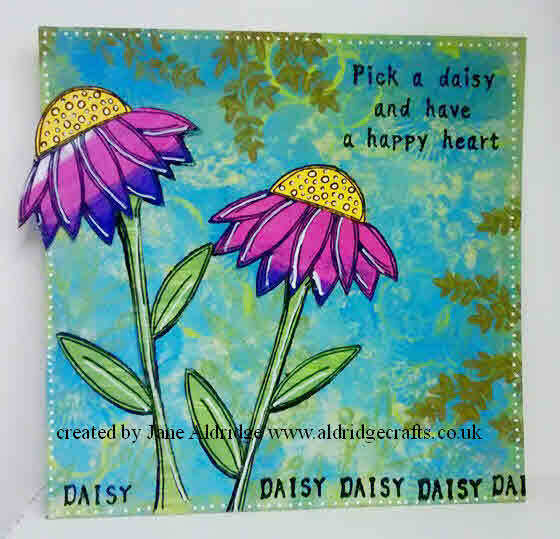 The flowers and side pattern are from the Kim Dellow PaperArtsy stamp set – EKD04 – a fabulous bold flower design which has dots that I’ve accented with Stickles and then added some white highlights with my white sharpie pen. 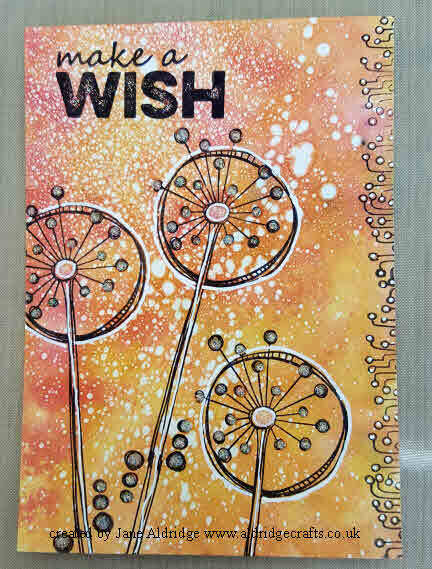 The make a wish is from the ELB28 Lin Brown PaperArtsy set – a favourite of mine as I love my sayings! This is a nice, quick easy project to make – as the designs are so fabulous you don’t need to add a lot of detail to make an eye-catching design. We don’t sell our alcohol inks online (due to postage restrictions) – but we have a huge range of colours available in the shop! 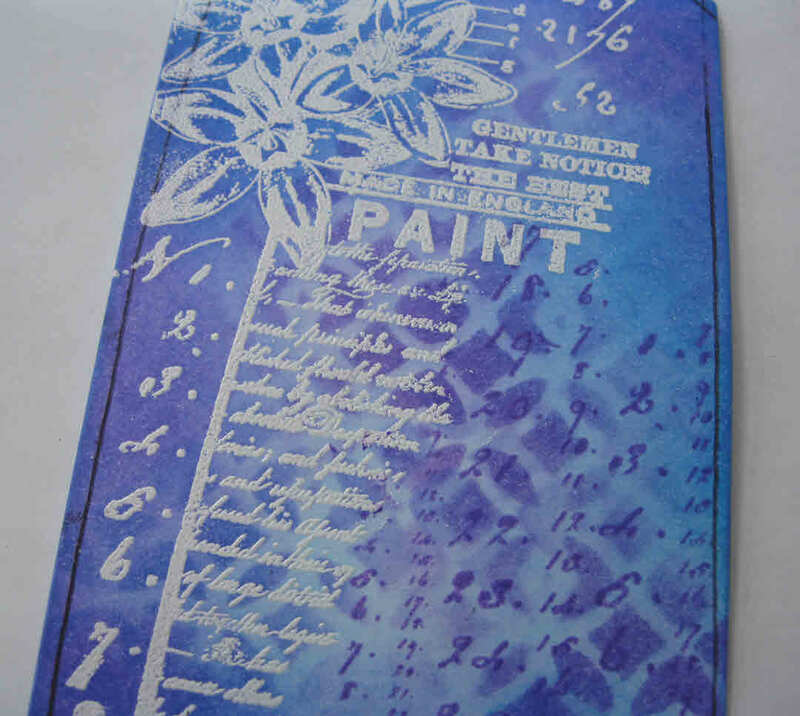 I recently attended a training weekend with PaperArtsy and then time has just whizzed past and I haven’t had a chance to do anything with the stamps I got on the day. 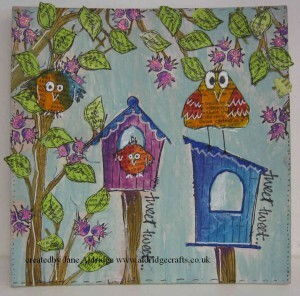 I’ll be soon getting these new designs in stock – once time allows!! 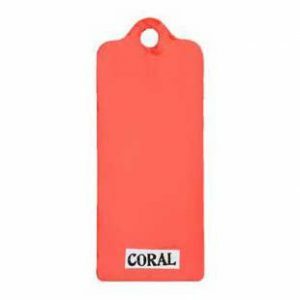 So a quick and easy tag idea for you. 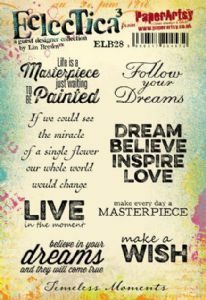 I started by stamping and embossing my flower stamp in White embossing powder (have you seen we now stock loads of Wow embossing powders – they are fab!! )… sorry – easily distracted…back to my design. 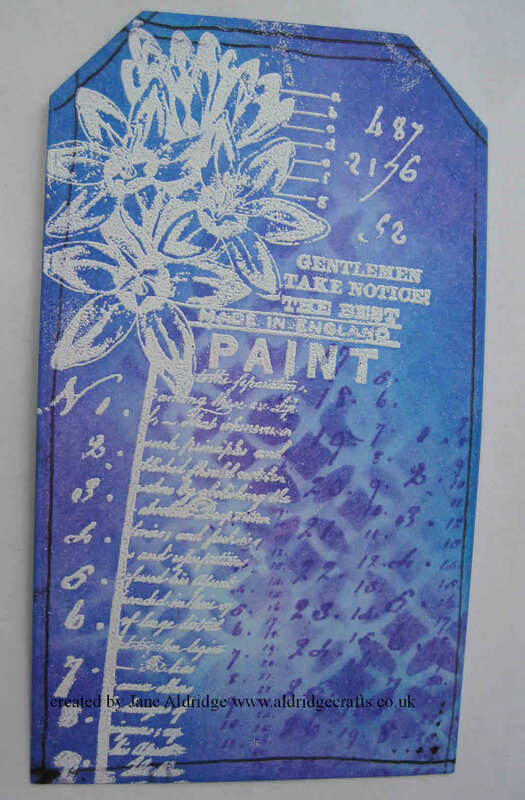 So, once you have embossed, then go over the top with distress inks – I’ve used Blueprint Sketch and a mix of the other paler blues applied with my applicator for smoother blending. 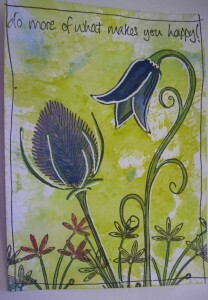 A final addition of some ink through a stencil adds a bit of further detail. 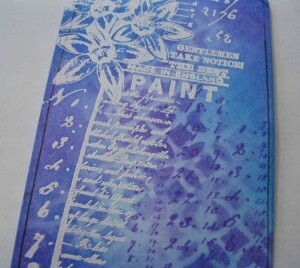 Finally take a soft cloth and buff up your white embossing to remove any distress ink resting on top of it. 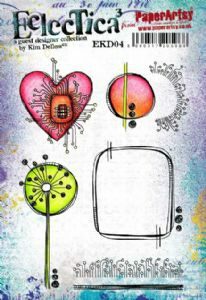 Its a fun technique that can be ideal for a quick card idea.